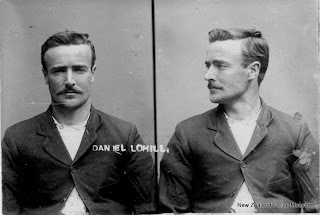 On 2 March 1908, the labourer and railway porter was charged - and the now infamous mug shot was taken - for allegedly stealing a bicycle and a fur necklet in Napier. He was later acquitted on the charge of stealing a bicycle, but sentenced to four months at Napier Prison on the charge of stealing the necklet. Tohill's criminal record ended there, and he later moved with his wife and young children to Auckland, where he died in 1950, aged 68. Tohill's Dunedin-based grand-nephew, Dylan Tohill (43), knew little about the family other than that they poor and was pleased to find out that his relative had achieved online success so long after his death. Check out the New Zealand Police Museum: Suspicious Looking online exhibition for more information about the invention of mug shot photography, the introduction of mug shots to New Zealand and much more.